Paintings are small. Even those that are relatively large are still tiny compared to the world. The desire to escape this limiting condition has been integral to the history of Western painting since the Renaissance, and it has registered in talk about painting since then as well, in the dominance that the painting-as-window metaphor, with all its connotations of openness and extension, has enjoyed over the metaphor of painting-as-box, with its connotations of closure and withdrawal. “Then it occurred to me that it could be a box in which all my works would be collected and mounted like in a small museum, a portable museum, so to speak.” This is Marcel Duchamp talking about his monographic box-in-a-suitcase, which contains sixty-nine miniature replicas, photographs, and color reproductions of his own works. More willing to entertain Duchamp’s irony, Benjamin Buchloh describes Duchamp’s Box in a Valise as a critique of commodity fetishism that is still caught in fetishism’s thrall: “All the functions of the museum … are minutely contained in Duchamp’s Valise: the valorisation of the object, the extraction from context and function, … arbitrary movements in time and space, multiple ownership and privacy of possession.” The box, according to Buchloh and Smithson, is a repository for the sentimentalized and domesticated. It is made to hold discrete things and, thereby, facilitates the circulation of commodities on which capitalism depends. Indeed, boxes travel well from place to place. 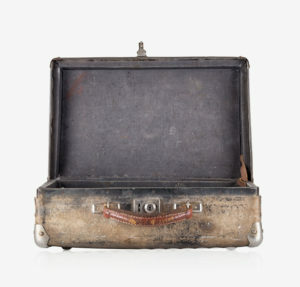 (Suitcases are nothing more than boxes with the added convenience of handles. One of the ironies of Duchamp’s box-in-a-suitcase is the redoubling of this portability.) They also allow their contents to travel through time, storing them so they can be used at some later date. Each time something is boxed so it can be transported to another location, it is also readied for another occasion. With each re-opening, the contents of the box will find themselves at a temporal remove from where they were before, having missed, in a certain sense, everything that happened in between. In this essay, I will make the case that paintings have been box-like for a long time, and that a corresponding desire to move beyond that condition has been around for a long time as well. Smithson’s and Buchloh’s disdain for the box—their preference for a more site specific and less portable and, therefore, less marketable art—is only one, relatively recent, expression of this drive. Their primary target, the modern easel picture, was already an attempt to escape the box that earlier images had inhabited, insofar as its illusionism was already a reaching for the world beyond the frame. AMY KNIGHT POWELL is Associate Professor of Art History at the University of California, Irvine. 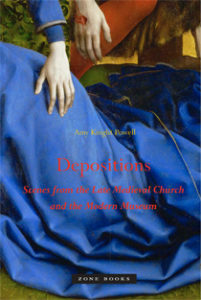 She is the author of Depositions: Scenes from the Late Medieval Church and the Modern Museum (Zone Books, 2012).